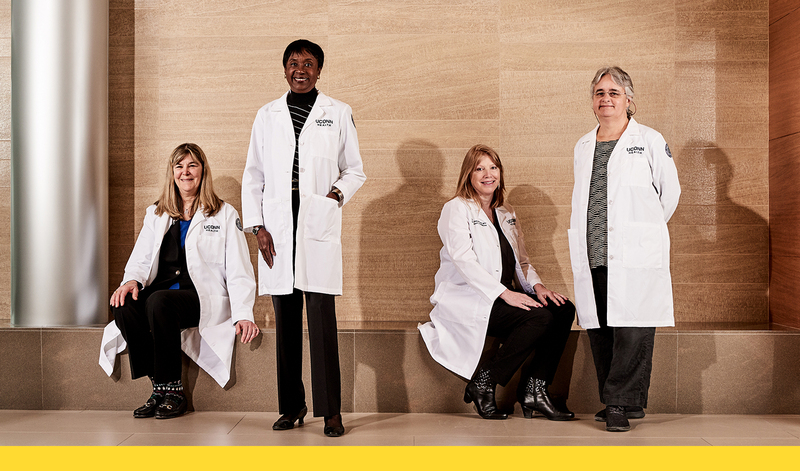 At UConn Health, dedication to the achievements of women in medicine and science dates back to our founding in 1968. Efforts to achieve gender parity in our student body and among faculty and staff and their positions as leaders have grown over the decades. Dr. Molly Brewer, Dr. Marja Hurley, Dr. Cheryl Oncken, and Dr. Laurinda Jaffe are among the women leading UConn Health’s departments. In 2017, the number of women enrolled in American medical schools surpassed the number of men for the first time, according to the Association of American Medical Colleges. And, UConn’s schools of Medicine and Dental Medicine were part of that demographic shift. There are now more female than male students enrolled — 207 female medical students comprise 50.7 percent of the student body, while 94 female students make up 52.5 percent of the dental school’s student body. Although the first class admitted to the UConn School of Medicine in 1968 was all men, the faculty has included women from the start. Over the years, the number and roles of women at UConn Health have grown significantly since four accomplished women stood among the founding faculty. Today, 73 percent, or 4,098, of the total employees who fuel UConn Health’s clinical care, research, and education initiatives are female. Across the enterprise, 895 women hold faculty or community faculty appointments and 217 women are full-time UConn Health faculty. There are nearly 800 female nurses. Among the women leading the charge are department chairs on the front lines of advancing medicine and cutting-edge research: Dr. Molly Brewer in Obstetrics and Gynecology, Dr. Cheryl Oncken in Medicine, Dr. Melinda Sanders in Pathology and Laboratory Medicine, Dr. Laurinda Jaffe in Cell Biology, and Dr. Sandra Weller in Molecular Biology. Many others serve as associate deans. I have been able to achieve everything that I’ve wanted to at UConn Health, from becoming a leader to teaching and my efforts to enhance our student curriculum. Dr. Marja Hurley, the School of Medicine’s associate dean for health career opportunity programs, was the first woman of color to attend UConn’s medical school in 1972 and one of eight female students in the class. In addition to a stellar career as an NIH-funded physician-scientist conducting research on the molecular basis of osteoporosis and osteoarthritis, Hurley has dedicated the past three decades at UConn Health to advocating for women and other underrepresented groups in medicine and science. Through health career opportunity programs including the Doctors Academy, High School Mini Medical/Dental School Program, and the Summer Research Fellowship Program, Hurley also works to expand the interest of high school and college-aged women and men in science and medicine. “It’s been a pleasure to spend my education, training, and career here at UConn and to help diversify the schools of Medicine and Dental Medicine with more underrepresented groups, including women,” says Hurley. Currently, groups that are traditionally underrepresented in medicine and science comprise 22 percent of UConn Health’s student body. “We have made tremendous progress,” she says. As an American Association of Medical Colleges liaison, Hurley in 2011 launched a Group on Women in Medicine and Science (GWIMS) chapter at UConn Health. Its mission is to connect women at the institution and promote their career success within the academic medical center by addressing issues such as salary and gender equity, recruitment and retention, awards and recognition, career advancement toward full professor, and work-life balance. Recently, GWIMS member Kristyn Zajac, Ph.D., assistant professor in the Department of Medicine, helped establish a “Mini Mentoring Program.” More than 70 senior faculty volunteered to serve as mentors to female junior faculty. Dr. Ellen Nestler, internist and associate dean at UConn School of Medicine, was assigned to mentor Evelyn Neuber, Ph.D., an embryologist and clinical research coordinator at the UConn-affiliated Center for Advanced Reproductive Services. Melinda Sanders, chair of the Department of Pathology and Laboratory Medicine, joined UConn Health 26 years ago and was promoted to chair in 2010. “I have been able to achieve everything that I’ve wanted to at UConn Health, from becoming a leader to teaching and my efforts to enhance our student curriculum,” she says. Educating the new, more representative class is critical as they will be the next generation of providers. “Here at UConn Health, we really do want to foster women and develop the careers of future generations of women in health and science,” she says. Dr. Montgomery Douglas has been elected an officer of the American Board of Family Medicine for a one-year term. Dr. Marja Hurley received the American Society for Bone and Mineral Research 2016 Lawrence G. Raisz Award, in recognition of outstanding achievements in preclinical and translational research. The Outpatient Pavilion at UConn Health’s Farmington campus, which opened in 2015, was named the best in ‘New Construction’ in the state by The Connecticut Building Congress (CBC). The honor was for exemplifying construction excellence and best practices in teamwork by project owners, architects, engineers, constructors, and trades. Dr. Cheryl Oncken has been appointed Chair of UConn Health’s Department of Medicine. Oncken, an internationally known tobacco researcher who joined UConn’s faculty in 1994, brings to the position considerable administrative experience as the program director of the Lowell P. Weicker Clinical Research Center and director of Cancer Prevention and Control at the Neag Comprehensive Cancer Center.